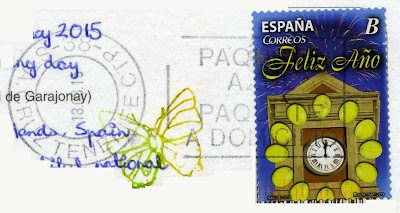 I'd been looking for a postcard of Garajonay National Park for quite a while, and even swapped for one a while ago but never received that postcard. I was therefore really happy when this swap with Patricia worked out well. 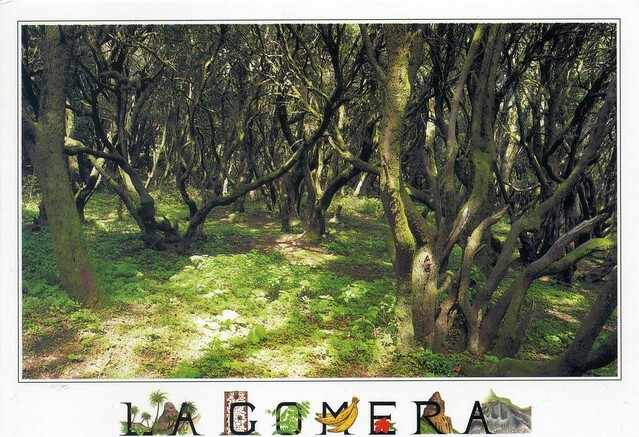 Garajonay National Park is located in the center and north of the island of La Gomera, one of the Canary Islands, Spain. It was declared a national park in 1981 and a World Heritage Site by UNESCO in 1986. It occupies 40 km2 and it extends into each of the six municipalities on the island. The park is named after the rock formation of Garajonay, the highest point on the island at 1,487 m. It also includes a small plateau whose altitude is 790-1,400 m above sea level. The park provides the best example of Canarian laurisilva, a humid subtropical forest that in the Tertiary covered almost all of Southern Europe. It is also found on the Azores and the Madeira Islands. Laurus azorica, known as Azores laurel, or by the Portuguese names louro, loureiro, louro-da-terra, and louro-de-cheiro, can be found in the park, as well as Laurus novocanariensis, known as Canary laurel. Although named as a single type of forest, the national park englobes several varieties of forests. Most humid and protected valleys oriented to the North have the richest and most complex forests. It is known as valley laurisilva, a true subtropical rainforest where the largest laurel trees can be found. At higher altitudes, with less protection from wind and sun, the forest loses some of its more delicate species. Here it is called slope laurisilva (laurisilva de ladera). At the south the forest is mainly a mix of beech and heather, species adapted to the less humid atmosphere. Other attractions of the national park are the massive rocks that are found along the island. These are former volcanoes whose shapes have been carved by erosion. Some, like the "Fortaleza" (fortress in Spanish) were considered sacred by the native islanders, as well as ideal refuges when attacked. The park is crossed by a large network of 18 footpaths, trekking being one of the main tourist activities in the island. Many of the species of flora and fauna are endemic to the Macaronesian islands, the Canary Islands or La Gomera, and the Garajonay forest harbors a rich biota of understory plants, invertebrates, and birds and bats, including a large number of endemic species.